Still haven't planned that perfect Valentine's date for your sweetie? Don't worry, it's time again for our Lovers Nite Out Give-A-way! We are giving away 2 tickets to our matinee performance of the Louisville Is For Lovers Showcase at StudioWorks (1503 Bardstown Road) on Friday Feb. 15th 4pm-7pm, followed by a Valentine's dinner for 2 at the Reservation Only White Castle Valentine's Dinner (Reservations for 8pm at 4020 Shelbyville Rd) with table service! And that's not all! 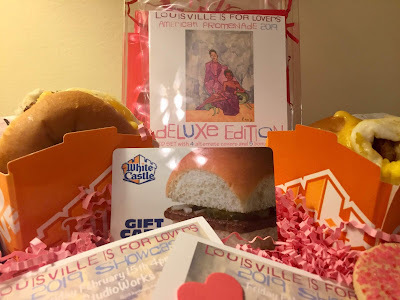 You will also receive the 2019 Louisville Is For Lovers Deluxe 2 CD Box Set with all exclusive songs by Louisville Artists, and matching Louisville Is For Lovers T-shirts! Just leave a photo of you and your lucky Louisville sweetie in the comments section of our post on our FB page or share the post for a chance to win. Winner announced Friday Feb. 8th, Valentine's Prize Package will be available for pick up at the Louisville Is For Lovers Showcase on Friday Feb. 15th at StudioWorks with Your Band, Sam Filiatreau & Maggie Halfman, Monkey Boy, Fiji Waters, & Eyeball. 4pm & 7:30pm. All Ages. Ticket info Here.